I received a critique of my Henna series specifically for using the word 'chemical' to describe Lawsone in Henna. Yes someone wrote to me (professed lover of all things chemical and married to a chemist) to complain about the use of the word chemical! I am going to definitely have to get on my soapbox and preach....but not now.....later! Onward and upwards !! Question received - Can Henna 'fix/repair/mend' split ends? Unfortunately the only known remedy for split ends is a pair of scissors. Remember that the dye in Henna (Lawsone) is highly attracted to protein. It therefore will form bonds with hair directly as opposed to bonding to itself to seal up the split end. Here is a diagram (Scientists love diagrams :)) of the explanation above! Very interesting. Thanks for the diagram, I am such a visual learner! This post definitely helps to clear up several unanswered questions I had. Thanks for the great info! 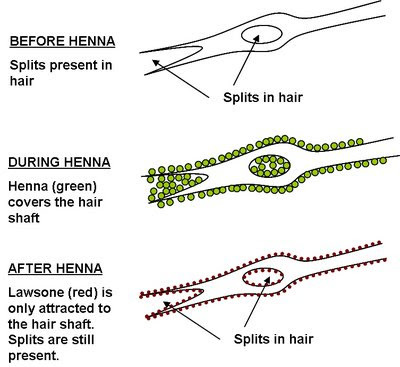 I know this is a bit late but, based on your diagram and explanation, I'm wondering if Henna would cause the split to swell with repeat application. It is never too late! Great question too but I'm stumped! I guess it depends on the size of the split. 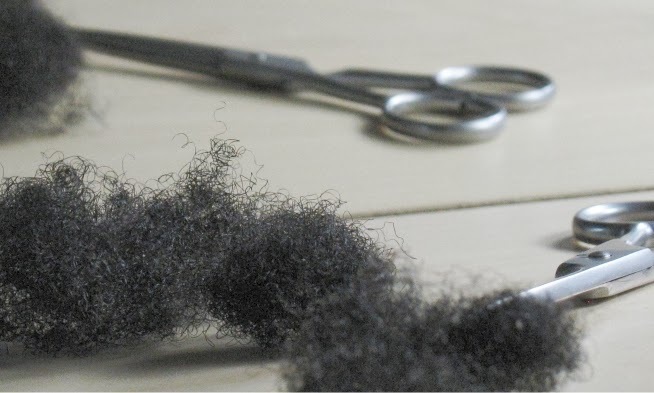 If the split is quite small, perhaps then the lawsone may bind and expand it but if the split is large, then henna may just bind to hair on both sides of the split and not interfere with the size of the split. Great question! Thanks for the quick reply. I only ask because I noticed that after I started using Henna, while my hair is stronger overall, the splits seem to be more noticeable.